It started with a bachelor party. David Chait became frustrated with never-ending e-mail threads, being stuck with bills and the disorganization surrounding the whole trip. Mostly, he was frustrated that there were no tools available to relieve him from a group travel nightmare. The result of that nightmare was Travefy, an online and mobile group travel planner headquartered in Lincoln. 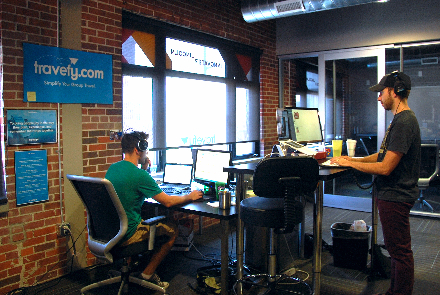 In 2012, Chait, the CEO and co-founder of Travefy, began working alongside co-founder and CTO Chris Davis to create the business. 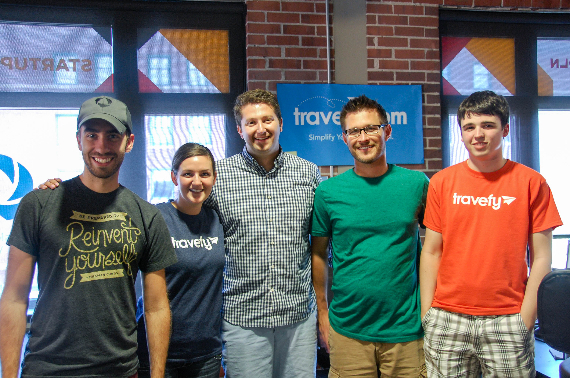 Today, Travefy has eight full-time employees and two interns, located both in Lincoln and in their Omaha office. Their mission: "To bring people joy in the way they plan, experience, and remember their trips together." Downtown Lincoln sat down with Chait and Stephanie Gries, Travefy's community outreach manager, to discuss the growth and history of Travefy, and why failure and success work hand in hand. DLA: Have you run into any apps similar to yours or have you found yours is unique in what it does? David Chait: I think Travefy is wholly unique. They have the phrase "necessity is the mother of all invention", and that exists for a reason. The genesis of Travefy, where it came from, was from trips I was taking at the time, particularly bachelor parties. It was all of those nightmares; we had this e-mail thread that was never-ending and we couldn’t get anything organized and there were money issues- I was actually left with a lot of bills. I was looking for Travefy, not a business idea, but "what out there could solve this?". You have a lot of single dimensional tools that solve problems that are great. If you need to book a hotel room, there’s Expedia, Priceline, pick your favorite, they’re fantastic. If you need to talk to people, there’s SMS, Facebook. If you need to pay money to one person, Dwolla, Venmo. But there actually was no universal application for all of the communications for planning a trip. So that I think is one of our key differentiators. There’s a bunch of great individual tools out there, but we wanted them all together. DLA: How do you go from having this good idea to a fully functional app or site? Chait: You become willing to fail. We didn’t want to take an ivory tower approach. We didn’t want to hunker down in a room and spend years building something without human input. We also were willing to try lots of things. We know the problem we’re solving, and that 30 percent of the things we're going to build, are going to be terrible and not going to work. That's when we just started building and we always listened to consumer feedback. What we started with was this large idea solution. What we found was that you need to start with a solid nugget apiece. Everything we have done has been five steps forward and one step back, but that’s been great. We’ve learned from that every time. DLA: Do you feel like you’re still building on what Travefy is? Chait: Absolutely. It’s really cool and you know that you’re still innovating when everytime you look at a snapshot, whether it’s user data in terms of size or literally a screenshot of the site from six months ago, you say, "Oh my god, that’s Travefy?". The second you close that feedback and you’re not trying to build new features or innovate or improve, I think that’s when your company dies. DLA: Since Travefy is free, how do you guys make money off the app and site? Do you guys pair up with certain sites that show rates? Chait: We make money in two ways. Number one, if you buy something – which you don’t have to – through our discover section, which allows you to identify restaurants, hotels or activities, we get paid from those companies. Secondly is our expense manager, which is one of our most popular features, where we help to track and take care of shared expenses. If you use the actual collections, we take a small percentage fee as well. DLA: Do you guys see more use from the app or website? Chait: The app is actually very new. As part of the lean mentality that we’ve had, we started by building a mobile responsive but browser-based solution recognizing it’s the quickest way to development and the most versatile. We also wanted to learn which pieces of it people need to be native components, or actually things you can do offline with the app, etc. 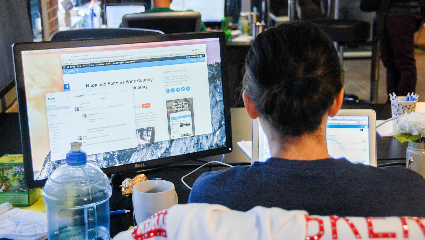 We took those lessons and saw that about 30 percent of our users were accessing it on mobile. The app has been out for about a month now. DLA: What kind of feedback have you seen on the app? Gries: The feedback has been really good, I mean it’s nice seeing if there are any bugs or something – and we have a team that’s really responsive and really quick to make changes – but I don’t know if there’s any big changes with the app since it went live. Chait: I think people are really happy because we’re letting them interact with Travefy the way they want. DLA: So you guys have an Omaha office and a Lincoln one. Does the Omaha office do anything different than the Lincoln one, or why the need for both? Chait: The Omaha office is also about a month old. For us, we have a lot of core values as a team. 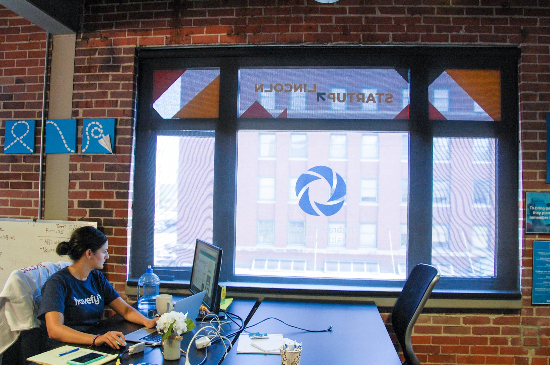 One of those is to care about the product but also care about the team and we have quite a few people who live up in Omaha, so for us it was recognizing whether the cost differential of opening an Omaha office was something we could absorb. And it was something that allowed for us to give a better quality of life to several employees by having the option to work there a few days a week. If at any time we can make a decision that enhances team quality of life, we’ll always make that a priority. DLA: Stephanie, how did you get involved? Gries: I started as an intern at BuluBox, another startup downtown, and was interested in marketing. When I heard about Travefy launching I wanted to be a part of it. Travel has always been my favorite thing in the entire world. I’ve always kept my eye on Travefy and used it, and my husband who works at Hudl actually uses it for Hudl. We would always use it for our trips and everything and I always thought it was an amazing program. Chait: Stephanie is the best, she’s the voice of Travefy and the moment she became available we snatched her up and we’re very lucky. DLA: Is there anything else you guys want to add? Gries: [to Chait] Why did you decide to start Travefy in Lincoln? Chait: Yeah, so I’m originally from the East Coast. Previously I worked at the U.S. Small Business Administration, so we did a lot of work across the country merging tech hubs and those kinds of things. One of my biggest takewaways from that was, outside of the places you commonly think of as tech hubs like New York (which is home for me) or Silicon Valley, you’ve got these great pockets across the country with amazing talent coming out of universities like UNL. In Lincoln you’ve got the right ecosystems in terms of money and venture funds as well. You also have a much lower cost of living so you can create amazing high-paying jobs. So when starting Travefy, I specifically wanted to look for an environment where we could build a really great sustainable business with great jobs.